Is there anything quite like setting out on an adventure, with the open road ahead and some new memories to be made? We’d be hard-pressed to find a better way to celebrate life. Perhaps the only way to top it is to do so surrounded by the ultimate in luxury amenities. In the newly arrived Winnebago Adventurer Class A Motorhome, you will do just that. Elegantly appointed with the power to take on any uphill challenge, this Class A has the moxy to deliver. Decked out with Winnebago’s exclusive features, like a Glide & Dine dinette, Ultraleather furnishings, and MCD roller privacy shades, this Class A Motorhome will keep you wrapped in comfort no matter how long the journey. And with its durable construction, the Winnebago Adventurer has the strength to last for miles and miles. Built on a Ford F53 Chassis and powered by a 362-hp 6.8L V10 SEFI Triton® engine with a TorqShift™ 6-speed automatic overdrive transmission, the Winnebago Adventurer undoubtably outpowers the competition. 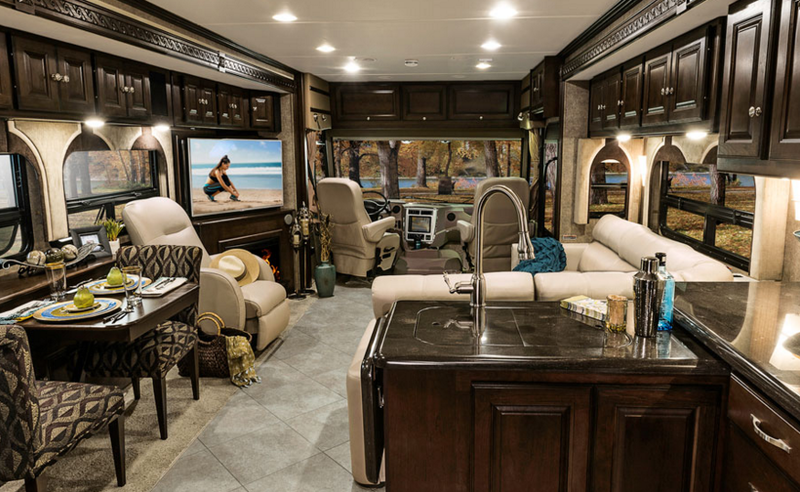 With its well-appointed interior and lavish master suite, the Winnebago Adventurer leaves little left to be desired. The only thing more you could ask for is clear skies ahead of you. Although a few rainy days spent relaxing and enjoying a movie or just listening to the crackle of the fireplace wouldn’t be such a bad thing. A pristine coach, the Winnebago Adventurer takes travel to a new level — and welcomes you to come along. There simply isn’t a feature missed in this Class A. From the stainless appliances to the recessed lighting, every inch of the Winnebago Adventurer has received an extra touch of class. Elegant, spacious, and reliable, the Winnebago Adventurer Class A Motor home is an exciting addition to the Bullyan RV family. Visit our Duluth, MN location today to discover the beauty and strength of this Class A!